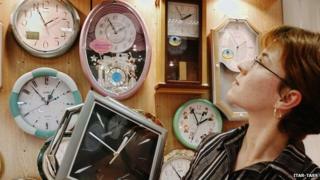 Russia will turn back its clocks for the last time on Sunday to permanently adopt winter hours. It will also increase its time zones from nine to 11, from the Pacific to the borders of the European Union. For the past three years, Russia has experimented with keeping permanent summer time, but it proved to be highly unpopular with many Russians. In 2011, then President Dmitry Medvedev introduced measures to reduce Russia's time zones to nine, and to keep summer time all year round. Changing times in the seasons disrupted people's biorhythms and even upset cows, Mr Medvedev said. However, many Russians in the north complained about darker mornings in winter. At a news conference in Moscow, representatives of the Russian Academy of Sciences said that Europe would now be closer as the difference between the capital and Greenwich Mean Time would only be three hours. When Crimea was annexed by Russia from Ukraine in March, Crimea's time was adjusted to match Moscow time (GMT +4).